Mr. Peter Christ led the rapid growth of the Battle Creek Area Community Foundation, and in this role also served on each of the major working groups to build the community foundation support systems in Michigan. He was deeply involved in the creation and implementation of the common computer system, branding, the work related to Michigan Community Foundations’ Youth Project, and the Michigan tax credit. After retirement, Mr. Christ continued as a consultant to Michigan community foundations through the Council of Michigan Foundations. From that perspective, he has had extensive, ongoing engagement in the development of many of Michigan’s foundations. Mr. Peter Christ talks about his career in philanthropy. Mr. Peter Christ talks about how community foundations adopted the Foundation Information Management System (FIMS). Mr. Peter Christ talks about the Council of Michigan Foundation's (CMF) collaboration on implementing FIMS. Mr. Peter Christ talks about the two models of leadership he has witnessed in community foundations. Mr. Peter Christ talks about how the key to replicating Michigan's non-profit sector is to listen and help empower communities. Mr. Peter Christ talks about the importance of continuing to find the right solution, even when you have made a mistake. Mr. Peter Christ talks about how the Council of Michigan Foundations (CMF) helps Michigan stand out as a leader in philanthropy. Mr. Peter Christ talks about what it means to be an effective community foundation. Mr. Peter Christ talks about community foundations in practice, with the example of Calhoun County. Mr. Peter Christ graduated from Battle Creek Central High in 1951 before attending Albion College to pursue a double major in economics and political science. After graduating and serving in the U.S. Army for two years (1956–1958), Mr. Christ attended the University of Michigan. There, he received a master’s degree in business administration (M.B.A.) with highest distinctions in 1961. Mr. Christ was born and raised in Battle Creek, Michigan. Mr. Christ was involved from a young age with a variety of community activities. In high school, he participated in football, wrestling, track, orchestra, the science club, the Spanish club, the glee club, student council, and the National Honor Society. In college, he also participated in football, track, the forum club, the economics club, the Albion College Players Club, orchestra, and the Interfraternity Council (1). Within these organizations he held a number of leadership positions including president, treasurer, and co-captain. Mr. Christ began his career as an insurance agent with Massachusetts Mutual Life Insurance Company, and over the next 29 years, worked his way up to vice president in the sales division. After leaving the company in 1990, Mr. Christ became the president and CEO of the Battle Creek Community Foundation. Mr. Christ later spent six years (1998–2004) as an adjunct professor at Western Michigan University in the public administration department. He also served as the interim executive director of the Burnham Brook Community Center, “a fitness and social center for active adults,” that is located in Battle Creek, Michigan. He combined his knowledge of Michigan foundations with his passion for education during his tenure as the interim director of the Dorothy A. Johnson Center for Philanthropy’s Grantmaking School, where he succeeded founding director Joel J. Orosz. He continues to work as a consultant through Peter J. Christ & Associates, LLC and works closely with the Council of Michigan Foundations, notably in their “on-site mentoring program.” His efforts include staff development, fund development, strategic planning, and community development. During the nine years that Mr. Christ served at the Battle Creek Community Foundation, he worked to considerably improve the organization’s financial standing. Assets increased from $13 million to over $55 million, and the number of donors doubled. He initiated a charitable gift annuity program to enhance the sustainability of the foundation. Mr. Christ also deeply valued and strove to add to the diversity of the board, staff, and volunteers of the organization. Mr. Christ believes that collaboration between foundations and grantmakers is key to empowering individuals and communities in creating change that is impactful and lasting. While serving as the CEO of the Battle Creek Community Foundation, Mr. Christ was integral in the efforts to develop a common computer software accounting system that would meet the needs of all community foundations in Michigan. Up until that point, Michigan foundations used a variety of different systems, which created a range of problems and inconsistencies. The Council of Michigan Foundations facilitated meetings of community foundations to discuss the possibility of developing a common system, and after extensive meetings, the collective approached the W.K. Kellogg Foundation with a proposal. The collective worked with Kellogg Foundation Program Director for Philanthropy and Volunteerism Joel J. Orosz, resulting in the development of a system called the Foundation Information Management System (FIMS), which was fully-integrated and created especially for community foundations. NPO Solutions, Inc., the company that developed FIMS, was very small at the time and computerization of community foundation processes was limited. The Michigan contract helped grow the company into a national vendor, while affording Michigan community foundations the opportunity to shape the development of the software to meet their common needs. Given the differences in size and complexity of Michigan’s community foundations, two related systems were developed; FIMS for mature foundations, and FIMS-light for newer foundations. FIMS is still used by most community foundations in the country. In 2001, NPO Solutions, Inc. was acquired by MicroEdge, LLC. During his tenure at the Battle Creek Community Foundation, Mr. Christ met regularly with a small group of his peers at CMF in order to discuss new initiatives and to provide overall leadership to the development of the community foundation field in Michigan. The list of organizations that Mr. Christ served as a board member, chairman, volunteer, or consultant over the last 50 years is staggering. He greatly contributed to a significant number and wide variety of philanthropic organizations that focus on education, health, and community development in Battle Creek and the southern Michigan area. Currently, Mr. Christ is affiliated with the Battle Creek Rotary Club, Battle Creek Area Educators’ Task Force, NorthPointe Woods, First Presbyterian Church, and the Mackinac Center for Public Policy. 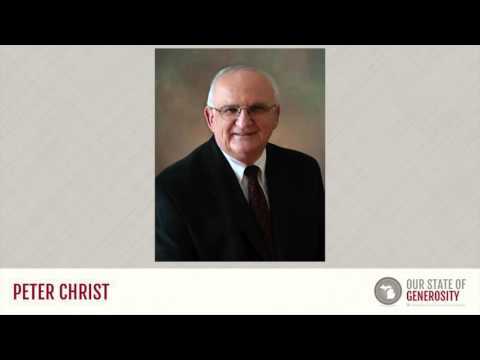 Mr. Christ was interviewed regarding his insights and experiences in working with Michigan’s philanthropic community and the Our State of Generosity (OSoG) partners. The following are selected quotations from his interview specifically related to the five organizing themes of the OSoG project.